Abell 2597 is a galaxy cluster located about 1 billion light-years from Earth. A survey galaxy clusters like this one suggest that star formation can be limited by a form of cosmic precipitation. Massive galaxies don't form nearly as many stars as possible due to a phenomenon known as "cosmic precipitation," a new study finds. When interstellar gas cools rapidly, it condenses and then collapses to form new stars. But all massive galaxies are powered by a central supermassive black hole, which can easily spew out high-energy radiation, heating the gas and halting star formation. Although astronomers have long suspected this, "the missing piece of the puzzle was: How does it know to do that?" said lead author Mark Voit, a professor of astronomy at Michigan State University. "What causes this thing to erupt?" It all comes down to temperature. Several years ago, astronomers recognized that in galaxies where the black hole was dormant, the surrounding gas was intensely hot. But in galaxies where the black hole was active, the surrounding gas was more varied and even cool, Voit told Space.com. So some galaxies are simply too hot to affect their black hole. Even if one region starts to cool, the intensity of the surrounding heat would keep it from cooling further. Think about dropping an ice cube into a pot of boiling water. That ice cube won't stick around for long. In cooler galaxies, however, the gas near the central black hole might be cold enough to form stars. But before it can form too many, the cool gas cloud rains down onto the supermassive black hole, which then triggers energetic jets that reheat that cool gas cloud and prevents any stars from forming. 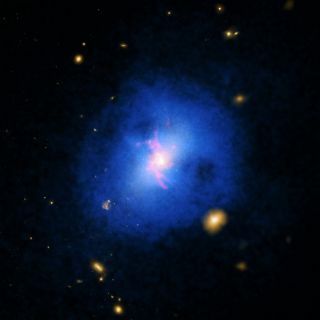 "We can say that a typical weather forecast for the center of a massive galaxy is this: cloudy with a chance of heat from a huge black hole," co-author Greg Bryan, a professor of astronomy at Columbia University, said in a statement. Voit, Bryan and their colleagues observed 200 massive galaxies in the middle of galaxy clusters using the Chandra X-ray Observatory and the South Pole Telescope. They found that the two aforementioned mechanisms regulate star formation depending on whether a galaxy is above or below a certain temperature threshold. "There's a transition where it goes from nice clear skies to all of the sudden very cloudy skies," Voit said. For clusters significantly above that threshold, any pockets of cold gas will quickly be reheated by their surroundings. For clusters below that threshold, cosmic precipitation heats the gas. The cycle of heating and cooling provides a feedback loop that regulates the growth of galaxies. "I've been struggling with this problem for 25 years, and it's like the pieces finally fell together," Voit said. The researchers have already started to probe other galaxies. "We want to find out if this principle applies to smaller galaxies and what these implications are," Voit said. "And what I can promise you is that that's turning out really good." The team's next results are currently in the referee process, but should be published soon. The initial study was published Jan. 20 in Nature.